Can you believe it? Yes, I’ve actually gotten myself organised and put together some more of your terrific photos and sewing stories to share. I hope you enjoy seeing them as much as I enjoy receiving them. I know Halloween was a long time ago now but I have to share this witch costume that Betty Ann has made. She made three costumes in different colors – two for her granddaughters and one for her own doll whose name is ‘Rosie’.She also had fun creating cute Christmas outfits for her Granddaughters. Betty Ann has used the T-shirt pattern, shortened the bodice and combined it with the skirt from the summer dress pattern. 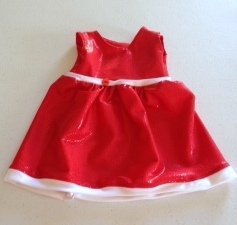 She has also cut panels in the skirt and used two different Christmas fabrics. Then to tie it all together she has used the same trim on the sleeves and the hem. Great job Betty Ann, it’s great to see you experimenting with my patterns. “The more I watch your videos and the more doll clothes I make the more impressed I am with your teaching, sewing, and creating skills! Although I love to sew I have never really become skilled at it and these doll clothes are helping me gain quite a few skills that are going to help in so many ways. 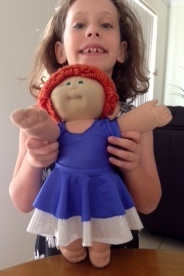 I’m thrilled that Hollins is having so much fun sewing for her granddaughter. 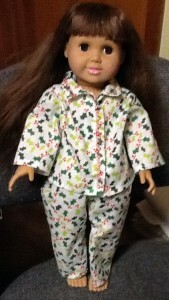 These winter pjs are just so cute in the Christmas print. If you’re looking for the four part video series Hollins is referring to where I show you how to alter my summer dress pattern to create over a dozen different outfits for your doll, you will find Part 1 here. Pamela has been sewing lots for her granddaughter, Kayla. 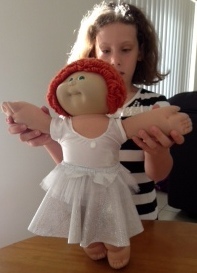 Pamela made the circle skirt that comes with the Ballerina pattern in both a long and short version and I love Kayla’s imagination as she has her doll wearing both! She has also followed this trend and put the tutu over the long skirt and it looks gorgeous. 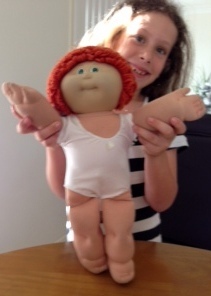 I can definitely see that Kayla is loving all the things her grandmother is creating for her doll. Then without Tayla knowing, Pamela has been very busy making more doll clothes that were to be wrapped up and given to her as Christmas gifts. I hope they all fit too Pamela as you’ve gone to a lot of effort to make some really cute doll clothes. I can see that there were lots of doll clothes in lots of Christmas presents this last Christmas and I’m sure that there were many special moments and memories of excited faces as the gifts were opened and the new clothes were tried on. Thank you all for sharing the fun you’ve had and the clothes you’ve made. 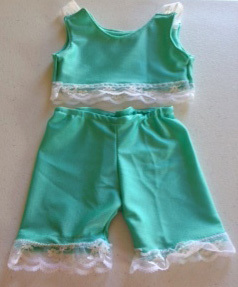 The holly pjs are just so cute. Makes me want a pair for myself! The dresses are adorable! I hope to have time somewhere to do it. Thanks for the insperation! They are all just so adorable! Great job.